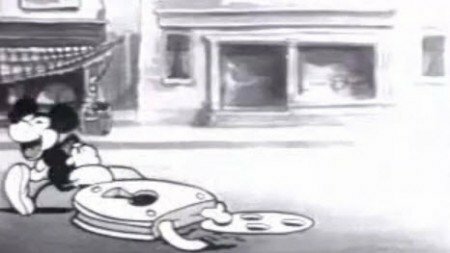 This short video from the 1930’s features beloved cartoon characters and is described on YouTube as “creepy” and “disturbing”. 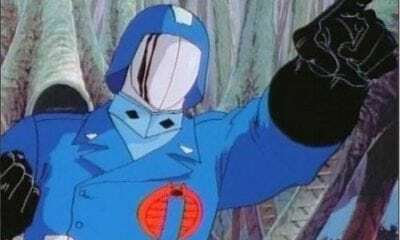 The cartoon is indeed very dark and bizarre but only minimal knowledge of Masonic symbolism is required to realize that the cartoon is all about secret societies and the ordeals an initiate must go through to be accepted. To the symbol-literate, it’s as blatant as it gets. Here’s the video. At the beginning of the cartoon, Bimbo (a good name for a non-initiate?) walks down the street without a care in the world. Suddenly, a certain cartoon character traps Bimbo down a manhole. Bimbo gets trapped…Mickey Mouse? Funny how this character is the recruiter that lead to Bimbo’s forceful initiation. Is it a thinly veiled comment on Disney’s Masonic ties? Bimbo then finds himself in the underground lair of a strange secret society composed of masked men with candles on their heads (symbolizing illumination?). One asks him “Wanna be a member? Wanna be a member”. When Bimbo’s answers “NO!”, he is sent to various sadistic chambers that recall the various ordeals that are imposed on new initiates in actual secret societies. At one point, Bimbo is tricked into thinking he would die. Near-death experiences have been part of secret society initiations since Antiquity. 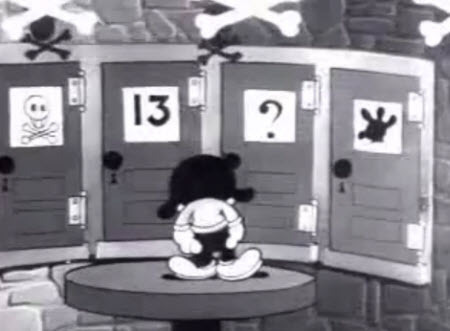 In the ordeal of the “Mystery Door”, Bimbo faces prominent symbols associated with Secret Societies: Skull & Bones and the number 13. After getting his a-s severely spanked, Bimbo finds himself in room with a Masonic checkerboard pattern floor. During his terrifying ordeals, Bimbo learns about the illusory nature of the material world, a fundamental concept communicated in occult initiations. After refusing to become a member several times, the masked man reveals himself and seduces him. It is Betty Boop! After watching her tap her own behind a few times, Bimbo realized that this secret society was aaaaalright. When Bimbo finally accepts Betty Boops offer, he discovers that all of the members were Betty Boop clones, which makes him very happy. In other words, secret society initiation might be difficult and terrifying but becoming a member provides great rewards. Looking at the symbolism of Bimbo’s Initiation, we realize that those who produced it were obviously “in the know”. 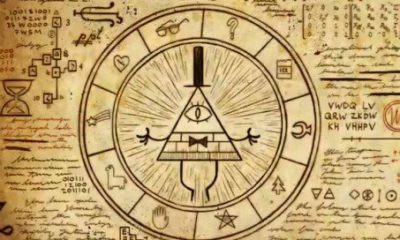 The cartoon is therefore yet another example of occult symbolism that can be seen by all, but meant to be fully understood by few. 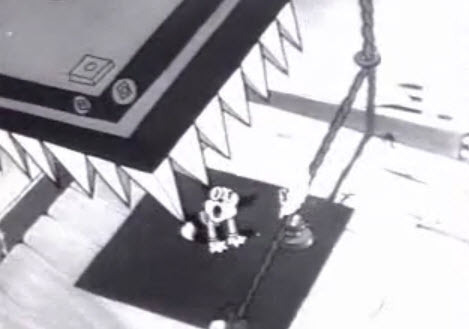 I find it very creepy that Mickey has absolutely nothing to do with the cartoon yet, he still is in it, locking Bimbo in the sewer. It's crazy! Gave me a weird chill down my spine…. I got a kick out of the caption under the last, Betty Boop pic LOL. I really don't think enough people approach this subject with a sense of humor. We should be laughing at these jackasses that are trying to rule the world and prey on us all, not feeding them fear. They get off on that. Truth be told, I'm very disappointed that this video so vividly depicts EXACTLY what I went through in my initiation into Freemasonry. So there it is, the secret is out. Wanna be a member ? Wanna be a member ? Being an ex student in this stuff , there is a 3rd degree masonic intiation in that cartoon when the light goes on @ 1.53 you will see a picture of a skull in the left hand corner. That is part of the 3rd degree master mason initiation. It's real spooky in detail because the intiate is placed in a coffin, broght back to life through the "light" ( satanic light -when it gets switched on) and the first thing you see is a skull. Was this the blue Lodge? Interesting, this Whitney Houstons' first video "How will I know" shares some similarities to this cartoon especially the first 30 secs. Take note of the phallus in the beginning. If cartoons are psyops tools it would explain why so many of them are so violent. This remembers me of a really old Little Lulu short I had on VHS when I was around 8-9yrs, it's from the 1940's, my mom used to buy me these old cartoons all the time. And in it, she get's in trouble in school has to sit with a dunce cap in the corner, and then basically ends up going through various trials and going to hell…. In case you didn't know Disney and Fleischer where fierce RIVALS,which might explain the glimpse of a "Mickey"-like character. 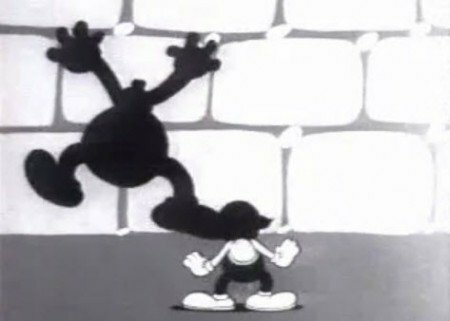 Disney got a lot of credit, but in reality the Fleischer brothers where the geniuses and great pioneers in the field of animation,producing many classic animations ex:Snow White years before Disney, and also the rotoscope ect. 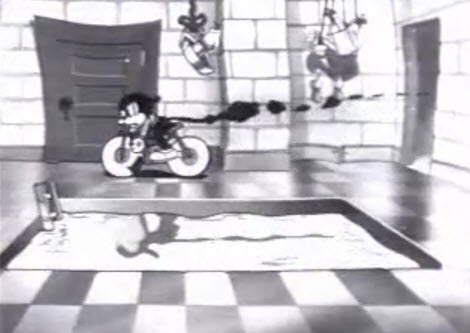 Also these Fleischer cartoons where NOT for children…the where shown before regular films in theaters for adults. So Fleischer was breaking copyright laws just to get a dig at Disney? what does a 'master' wear? a mortar board hat,the black square. Same with the forces and police with the checkered cap tally and square on a square badge ( symbolizing we control everything) we even make oaths perform rituals without even knowing it. Colleges are hugh recruitment agents with the whole greek house thing. brotherhood of the bell is a great film showing how this happens. All those of us who are waking up to the reality of what is going on are already protecting our kids from this brainwashing which is present in all children's "programming". Those of us without kids should get some asap… despite what the media tells us… they are the light of our world and a love that can never be expressed. And perhaps because these same idiots who are brainwashing us with all this garbage are also telling us not to have families is the number one reason why we should. So love your kids! These guys are running out of time and they know it, thats why they are pushing so hard to mold and shape and destroy our societies at such rapid speed right now… before the masses catch on and they themselves are destroyed instead. From Wikipedia: The cartoonist Jim Woodring identified Bimbo's Initiation as "one of the things that laid the foundation for my life's philosophy." Pretty much says it all. the "dea-i" sounds like a college frat chant or tra-la nonsense syllables – like the whole short, it could have a deeper meaning, or it could just be the Fleischer Studio messing with some cartoon effects. this cartoon appears in the Twilight Zone movie (1983). There is a cartoon about daffy ducks journey through math land on youtube… It has a lot of illuminati symbolism. In the ordeal of the mystery door there's also mickey mouse hand. This cartoon is from before diesny's "boom" and world fame.